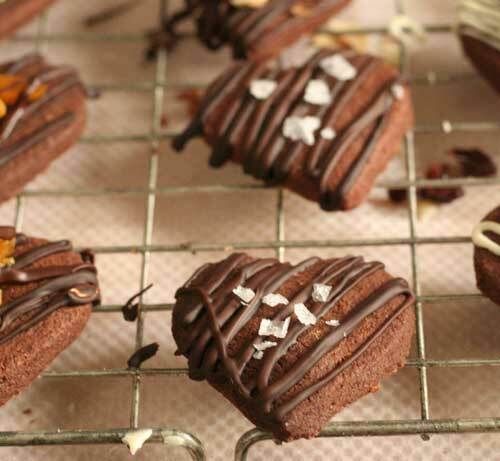 Alchemy in the Kitchen: ‘Just because...’ cookies - and Valentine's Day rebooted ! ‘Just because...’ cookies - and Valentine's Day rebooted ! If you listen hard you will hear the unromantic din of cash registers chi-chinging all over the world. That’s the sound of big business cashing in on the scurry to live up to romantic expectations - your own, or someone else’s - on February 14th. Valentine’s Day is quite possibly the least romantic day of the year. If you are someone’s special someone, hopefully you’ll already know it - and show it - in a thousand tiny ways throughout the year. You will be least in need of a day of ersatz romance. Love is bigger than just romantic love. It’s in the everyday things: in the sticky pre-licked sweet my tiniest niece presses into my hand when I know she really, really, really wants it for herself; it’s in the email/card/text/call that says between the lines “Hey, I was thinking of you”. It’s in making the dinner/walking the dog/cleaning the bathroom/rescuing the laundry from a sudden rain shower without having to be asked. It’s in accepting the irritating imperfections right along with the good qualities that are so much easier to love, whether you are family, friend, or lover. Since 2011, there has been a move to ‘reboot’ Valentine’s Day as Generosity Day; to make it less ‘cosy couples’ and more egalitarian. At first glance, this smacks of an ‘everyone-gets-a-medal’ race, but why not! Generosity Day is an opportunity to practice random acts of, well, generosity. It is a day for giving rather than taking. I’m celebrating February 14th (whatever you want to call it) with my fully customisable ‘Just because...’ cookies. I don’t need any excuse to make them. They can be ... Just because... I wanted to say thanks. Just because... you make me smile... Just because... sometimes you can read my mind. Just because... well... just because! To decorate you will need chocolate and sprinkles. I’m not going to be too prescriptive about this bit of the recipe – this is the ‘pimp my cookie’ bit, where you get to customise these cookies for those lucky people who are loved by you, but I’ll tell you what I did. 1. First make the cookies - Place the butter, icing sugar and orange zest in a mixing bowl or stand mixer and beat together until fluffy and lighter in colour. 2. Mix together the flour, cocoa powder and salt and add to the butter mixture about a third at a time, beating until well combined. Finally, add the egg yolk and dissolved coffee and mix until the ingredients come together in a ball. 3. Turn onto a lightly floured work surface and roll out to a thickness of about 3mm. 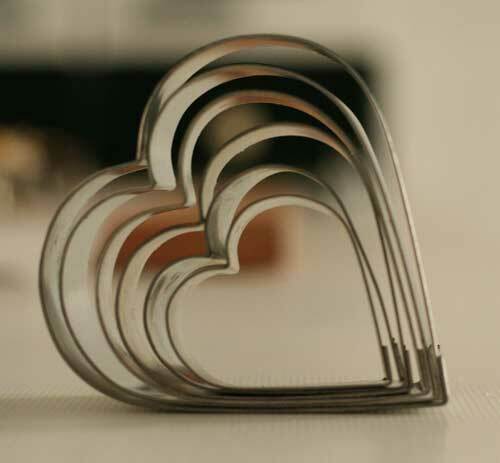 Using cookie cutters, cut into shapes – I’ve chosen hearts in a variety of sizes. Any leftovers can be squashed into a ball and re-rolled. 4. Place on a baking tray and bake in the pre-heated oven for 10 minutes. When the cooking time has elapsed, remove from the oven and leave to cool on the baking tray for about 3 minutes before transferring carefully to a cooling rack. When completely cold, decorate as desired. 5. I melted 100g of good quality white chocolate in a small Ziploc freezer bag by removing all the air, sealing it and putting it in a bowl of hot water. In another Ziploc bag, I placed 50g good quality dark chocolate together with 50g good quality milk chocolate and melted it in the bowl of hot water. This gives a subtle two-tone, two-flavour effect. 7. 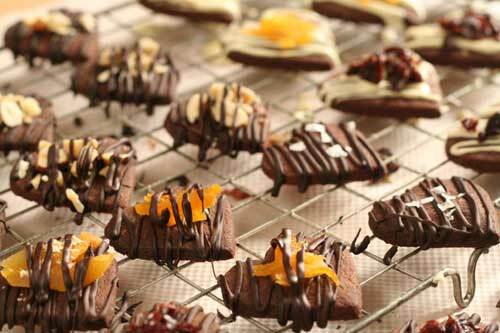 When the chocolate had melted, I snipped a tiny corner off each bag, drizzling chocolate directly onto the cookies. 8. While the chocolate was still melted I sprinkled my chosen toppings onto the cookies. Just because... you deserve a treat! Just because... you are salt of the earth! Very cute cookies! 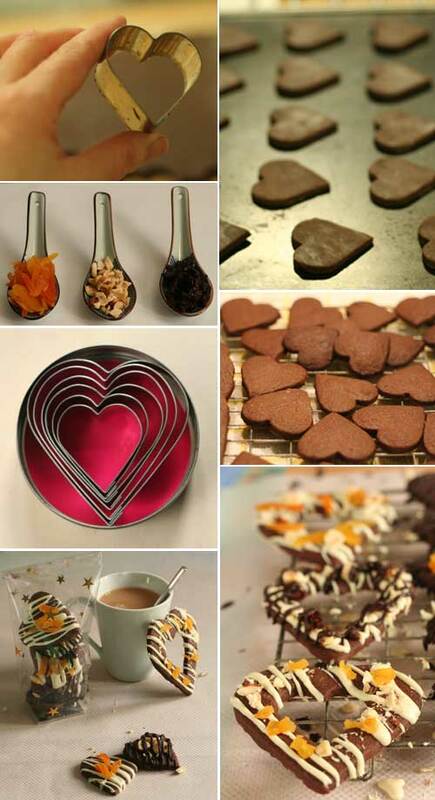 I need to start baking some VDAY treats tonight. May I have some cookies just because I REALLY love these? :) Looks wonderful. You can tell that I'm not ready for Valentine baking because I don't even own a heart shape cookie cutter. Hmmm must buy one. We can use regular round one too but these heart shape ones (the ones which have hole especially) are much cuter! These look incredible my friend, loving the deliciousness! Couldn't agree more with you on it being one of the least romantic days, Hester. We always avoid going out at this time since the harassed service is usually rotten. Can just imagine the taste of your cookies. I'm like Nami - believe it or not, I also don't have heart-shaped cutters! But now I'm a bit late anyway on the Val wagon, these call for being made at any time of year. Beauties! I loved these heart-shaped cookies, Hester. These look so so so pretty! And the way you presented them is making me crave for these right now!! Wonderful baking with great stepwise pictures. Loved it!! These biscuits are the best I have seen for Valentines day. You are right the best gifts come from the heart - not necessarily bought in a shop. 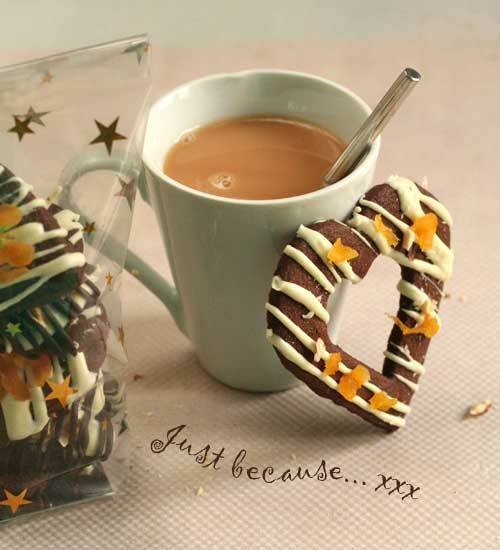 These are wonderful, I love that they're 'just because' biscuits too! I completely agree on Valentine's Day being unromantic--that's why we never go out to dinner then! These cookies look delicious--I'd kill for one right now with some sea salt on it. This is such a lovely blog post, I just had to share it. I think you have the right idea here. Lot's of folks don't have a significant other and feel left out on Valentine's Day. I like your version of the holiday much better. Your cookies are lovely. 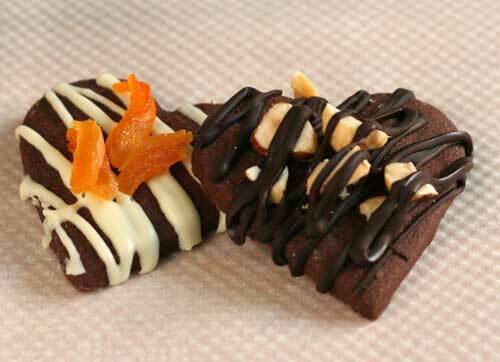 I love the way your drizzle the chocolate on top and topped with dried fruit. So pretty. These are such cute cookies, Hester! I think Valentine's day is most important when you're in high school, but does loose it's whole appeal once your out of it. I avoid restaurants like plague on this day, nothing exceptional and overcrowded. Hi there, I first stumbled across your recipe for pocket bread (which I can't wait to try) and after looking around found this biscuit recipe. YUM! I have just pulled a batch out of the oven and the taste amazing (even un-decorated).